For real: If you shine a low-pressure sodium lamp on a yellow sodium flame, the flame will be black. Flames emits light and heat, so it seems impossible to make black fire. However, you actually can make black fire by controlling the wavelengths of absorbed and emitted light. Alcohol is the fuel for the flame. The reason for using it instead of a candle, wood, etc., is because alcohol tends to be fairly pure and burns with a clean nearly colorless blue flame. Which kind of alcohol? It really doesn’t matter. You can use rubbing alcohol (isopropyl), ethanol, or methanol. If you’ve got an alcohol lamp handy, use that. Otherwise, you can pour a small amount of alcohol into a heat-safe dish. Gas burners work well too, like you would find in a science lab or a gas stove. You’re basically doing a flame test demonstration here, if that helps. The salt solution is good old sodium chloride (table salt) in water. Sodium ions color a flame yellow. The concentration of the salt is not critical. Ideally, stir as much un-iodized salt into a small amount of hot water as you can. Really, the human eye is so sensitive to yellow, anything containing sodium will work, but it needs to be dissolved in water because you want the sodium ion (Na+). The low-pressure sodium lamp is what makes this project work. If you can find one in your neighborhood or workplace, take your flames there. Otherwise, you can get one online. You’ll read this type of lamp emits monochromatic light. Strictly speaking, that isn’t true. However, it mostly emits yellow-orange light from ionized sodium metal in the lamp. The two wavelengths of light are so close together (589.0 and 589.6 nm), it’s practically monochromatic. The other emitted wavelengths are much, much weaker. Get to the Black Fire, Already! Light the fire. Observe the color. Pretty, but boring, right? Drip a tiny bit of salt water onto the flame. The flame turns yellow. Welcome to the flame test. Sodium ions absorb energy from the flame and become excited. Eventually, each ion returns to its ground state, emitting a photon with a “yellow” wavelength in the process. Turn on the low-pressure sodium lamp and turn off any other light source. This type of lamp takes a little time to warm up. When it gets nice and yellow, observe your surroundings. Because the lamp emits monochromatic light, it turns the world black and yellow. Can you see any other colors? Strange. Now, drip a bit of salt water onto your flame. The part of the fire touched by the salt water turns black! 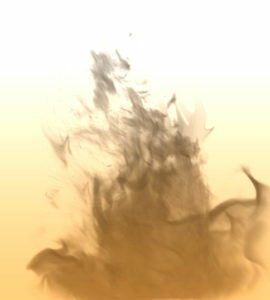 Notice under ordinary conditions a flame doesn’t cast much of a shadow, yet the black flame does cast a shadow. Note the flame looks black, but it’s still the same fire you had before you changed the lighting. It’s still hot. It’s still fire… just weirdly black. 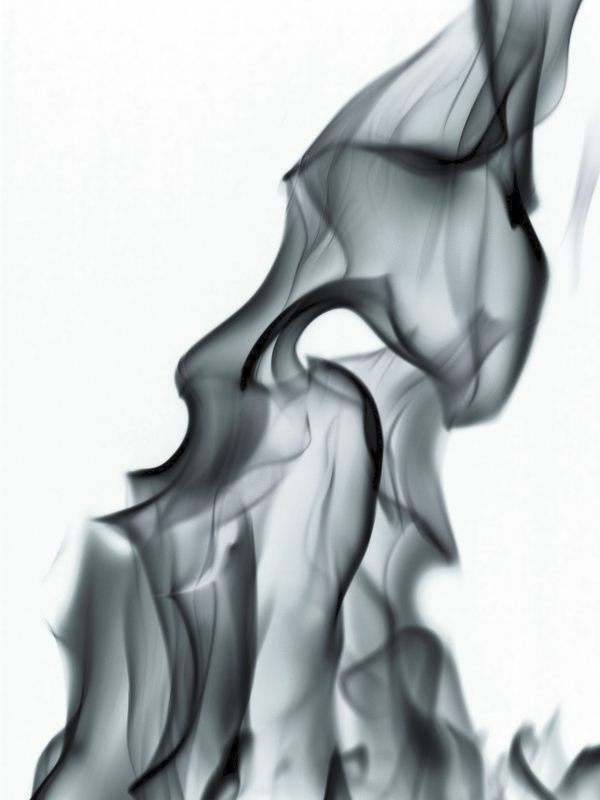 Black fire requires monochromatic light that matches the emission of the flame. It’s science, not magic. The low-pressure sodium lamp has the same spectral signature as the sodium-tinted flame. When you add sodium (from salt) to the flame, the sodium atoms absorb the light from the lamp because it’s exactly the energy they need. What happens when you absorb all the light? You see black. Now, if you look closely at your flame, you may still perceive a bit of color in the non-salted region of the flame. Mostly this will appear yellow because your eyes are much more sensitive to that color than the blue of the flame. Yet, the flame is emitting its own light, so your world may not be purely monochromatic. So, you’re hooked and you want to try this, right? Make sure you use a low-pressure sodium (SLS) lamp and not the (sadly, less expensive) high-pressure sodium (HPS) lamp. The HPS lamp emits a much broader spectrum of light, thanks to the addition of mercury. If you see the effect at all, it won’t be as dramatic. Confused about what to expect? Here’s a video demonstration of black fire, along with a look at the characteristics of flames and how they work. If you just want to skip to the black flames, go to 4:10. What can you do with black fire? Well, it makes a pretty amazing Halloween jack o’ lantern. Otherwise, it’s an interesting demonstration for a chemistry or physics class.